December 30, 2018 Rev. Robert Moeller, Jr. In the popular song, the little drummer boy tags along with the Magi to see Baby Jesus. Arriving at His house in Bethlehem, the Magi fall down in worship, offering Him fine gifts, gold and frankincense and myrrh. But the little drummer boy is sad because he has no gift to bring that’s fit to give the King. So here we are this evening—in His house, bringing gifts for the King. So, what sorts of gifts have you brought Him? Did you, perhaps, dress up in your nicest clothes to honor Him? Dressing up for God’s house is a good and worthy practice, to be sure—a way of remembering whose presence you are entering. But I’m sure the shepherds were just as welcome when they arrived to meet Baby Jesus in their everyday work clothes. How about offerings? Offerings are gifts, too. Offerings of money—that’s what we usually think of, but of course, there are other things. Time is a good gift. Money and time, elements of our very lives, gifts for our dear Lord. Our speaking and singing in the service, too—these are gifts we give to our Lord Jesus. Most certainly, all these things are good things to do, good gifts for the King. But stop and think about these gifts. The truth is, what we can give the Lord is nothing that isn’t already His. “The cattle on a thousand are Mine,” He says. “If I were hungry, I would not tell you; for the world is Mine, and all its fullness.” No matter what we give, all we’re doing is “re-gifting” back to the original Giver. Gifts for the King. What can you bring? Well, Jesus says, “as you did it to one of the least of these you did it to Me.” That’s something we can do, right? We can give money to charities to help the poor. And we can offer these gifts of mercy as our gifts to Jesus. Surely, He’ll be more pleased with these sorts of everyday “righteousness” sorts of gifts, right? But if you are doing these things for Jesus, save your energy. Does He need any of this? No! And for that matter, are your righteous acts really all that shiny and special? That’s not to say you shouldn’t do these things. To love your neighbor as yourself and to show mercy for the one who has need—all these things are good and worthwhile, commanded and commended by God. Just remember, Jesus doesn’t need these things; it’s your neighbor who needs them. By now, it’s obvious that you and I, like the little drummer boy, “have no gift to bring that’s fit to give the King.” Nothing we can offer is anything but stained and corrupted by our own sin, through and through. And the one who tries to offer this King even the smallest act of “righteousness” as though it were righteous in itself, well, that would be like coming before the emperor and flinging garbage and filth on his feet and expecting him to be impressed by such a fine gift. How about your heart? To be sure, that is the gift you most ought to give to Him. But even here, “I have no gift to bring that’s fit to give the King.” You and I have a bad heart condition. “The heart is deceitful above all things, and desperately sick,” says Jeremiah (17:9). Jesus goes into greater detail, “Out of the heart come evil thoughts, murder, adultery, sexual immorality, theft, false witness, slander” (Matthew 15:19). Merry Christmas, Jesus! Here’s my heart! Some gift, huh? Nevertheless, that is the gift you must give to Him. Not because it is good, but quite the opposite, because your heart, is bad, filthy with sin to the core. Still, the very best gift to give to Jesus is your sin. For one thing, it’s the only thing you can give to Him that is truly yours, which was never His gift to you in the first place. And beyond that, this is most definitely “the gift that keeps on giving”—all your sin and sinfulness; all your thoughts, words, and deeds; all your not doing the good that you would do, doing the evil that you’d like not to do. And along with all that sin and selfishness, and hurt and harm and hate against your neighbor (and his against you, too, for that matter), comes all those effects of sin—like sorrow and decay and pain and misery and failure and then… death. And then, Death again, forever. To be sure, in giving Jesus your sin, you’re not giving Him some prize, but you’re not giving Him some small trifle, either! But this is precisely the gift that He came to receive from us—or better put, to take from us. Most certainly, Christmas is all about exchanging gifts—the Great Exchange. The gift you must give to Jesus is your sin, selfishness, and all that goes with it—even your death and hell which would separate you from God forever. And in joyful exchange for such a gift, Jesus gives you His righteousness, His perfect love, His eternal life, and His own status of beloved Son of the Father. But how? How can you bring such a gift for the King? Can you find a box that you can put your sin and death into and gift wrap it? And where do you mail it to? How and where and when do you give Jesus your Christmas gift of sin? In Baptism, you already gave your gift of sin to Jesus, and received the gift of His righteousness. Daily, through contrition and repentance, you give Jesus your own proper gift—sin, and, in return, receive His gift to you—forgiveness for all your sins. In this Great Exchange, you give Christ all that belongs to you, and come away with everything that belongs to the King. So. Go ahead and give all those other gifts, according to the wisdom and love that God has given you—sing and dress up and give offerings and pray at church, and work hard to love those neighbors God has given you. But never stop giving Jesus the gift He came to receive from you—your sin, and never stop knowing that He has given you the greatest gift in exchange—His forgiveness, salvation, and life. This homily is adapted from a sermon by Rev. David R. Mueller. November 22, 2018 November 21, 2018 Rev. Robert Moeller, Jr.
“Then one of [the lepers], when he saw that he was healed, turned back, praising God with a loud voice; and he fell on his face at Jesus’ feet, giving Him thanks. Now he was a Samaritan. Then Jesus answered, “Were not ten cleansed? Where are the nine? Was no one found to return and give praise to God except this foreigner?” And He said to him, “Rise and go your way; your faith has made you well.” (Luke 17:15-18). It’s hard to bow down with a full belly. Pregnant women coming to the communion rail know this. Middle-aged men trying to pick up a scrap of paper from the floor know this. And on days like tomorrow (today), with Thanksgiving dinners, there will be a lot more people who experience this firsthand. But that’s just from the physical aspect. I would submit to you that it’s hard to bow down spiritually with a full belly, too. What I mean is that it is easier to turn to the Lord in hard times. It’s easier to keep God and His Word as a priority when you’re facing trials and struggles. But it’s so easy to forget the Lord and His many blessings when you are comfortable, when times are good. Martin Luther said: “The greater God’s gifts and works, the less they are regarded.” A hungry man is more thankful for his morsel than a rich man for his overflowing table. A lonely woman in a nursing home will appreciate a visit more than a popular woman with a party thrown in her honor. A Russian who finally gets his own copy of Scripture after seventy-five years of state-imposed atheism is more thankful for his little book than we are for all the Christian books and Bible translations that overflow our shelves. Ralph Waldo Emerson observed that if the constellations appeared only once in a thousand years, imagine what an exciting event it would be. But because they’re out every night, we barely give them a look. One of the evidences of the Holy Spirit’s work in our lives is a gradual reversal of this twisted pattern. God wants to make us people who exhibit a thankfulness on proper proportion to the gifts and blessings we’ve received. He wants us to become a people who realize that nothing we have comes from our feeble efforts, but solely from the merciful and gracious hand of God. We must learn that the only way to come before God is empty-handed as beggars. But that’s not easy to do, is it? It’s hard to bow down with a full belly. What would it take to get you to beg? What would it take for you to swallow your pride and ask for help from a total stranger, a passing acquaintance, even a close friend or family member? I submit that it takes at least two things to make such a bold request. First, it takes a sense of desperation, at the very least the recognition of a great need that you are unable to fulfill yourself. And second, it takes confidence that the one whom you are asking is able to fulfill that need. And so, we turn to the ten lepers in our Gospel. They are desperate. They’re all out of options. They’re dying from a terrible contagious disease. They can’t go to work. They can’t stay home. They can’t hug their wives and kids. The Law is clear: They are unclean. They are required to stay away from everyone else except other lepers. If anyone who doesn’t have leprosy happens to wander their way, these loneliest of men are required to shout out a warning to stay away. When Jesus comes along, the beggars shout from a distance. Not “stay away,” but “Jesus, Master, have mercy on us!” Somehow, they’ve heard. Though they’ve been ostracized and isolated, they’ve still gotten the news of Jesus and His miraculous healing. “Jesus, Master, have mercy on us.” This is a prayer of faith—or at least the beginning of faith. The lepers know Jesus through the wonderful stories that have been told about Him. The Word of Christ has worked faith in their hearts. Their plea for mercy is an expression of this faith. They realize that they cannot buy or barter for the blessing Jesus brings, but can only beg for it. And Jesus, seeing them, and fully away of their miserable plight simply tells them to show themselves to the priests. It was commanded in the Law of Moses that those who supposed themselves to be cured of leprosy must present themselves to one of the priests on duty at the temple, in order that their healing might be confirmed. If it was determined they had been cured of their sickness, then they were required to bring a sacrifice. The sacrifices in the temple included the shedding of blood, looking forward to the cleansing atonement of the Messiah, who, at that very moment just happens to be on His way to Jerusalem to offer His blood as the final, once-for-all sacrifice. Jesus wants the priests to confirm that the miracle has taken place. It will confirm that Jesus is who He says He is: the merciful one who cleanses the entire sins of humanity. As the ten obediently head to the temple, all of them are cleansed. Can you imagine the joy that all of them felt that moment? They, who were outcasts, who had no hope, who had no future to look forward to, now had received their lives back! They could go home to friends and family. They could kiss their wives again. Play with their kids. They were cleansed! One of them comes back—a Samaritan! The man praises God, bows down at Jesus’ feet, and worships. He has nothing to give Jesus in return for healing except his thanks. And while we usually highlight the ingratitude of the other nine at this point, this one only highlights the Lord’s mercy more. As a Samaritan, this man would not be able to enter the temple in Jerusalem. As Jesus notes, he is a “foreigner,” a term used by Jews with reference to Gentiles. In fact, this term appeared within an inscription posted on the barrier wall of the Jerusalem temple. It said: “No foreigner should enter…. Whoever does is himself responsible for the death that will follow.” It is most ironic, therefore, that this “foreigner” draws near to the living temple of God, Jesus Christ. There, his worship is received by God Himself, now incarnate. The man returns because he has faith. Jesus says so: “Rise and go your way; your faith has made you well.” That’s what faith does. It keeps running back to Jesus for more, because it never gets too full to bow down. Faith runs back with thanksgiving, because faith gladly says, “I had nothing to give, but Jesus was merciful to me anyway! I still have nothing to give, but Jesus will be merciful to me again!” Faith always runs back to Jesus for more. It never gets too full. This is perhaps the greatest tragedy of the other nine: Not so much that they don’t give thanks, but that they don’t come back to Jesus who has so much more to give them. They’ve got what they want most—they have their lives, health, families, and home back again. But they don’t have what they need most—forgiveness, faith, life, and salvation. They run to the temple—the dwelling place of God. They go to see the priests, not realizing that there in their very midst was the fulfillment of all the Old Testament sacrificial system—Jesus, the great High Priest, whose very body is the Temple of the Lord’s Presence come to earth. Then Jesus asks, “Were not ten cleansed? Where are the nine? Was no one found to return and give praise to God except this foreigner?” Jesus’ question tends to emphasize the ingratitude of those who did not return to give thanks, a big part of the reason that this text is the appointed Gospel reading for Thanksgiving Day. But there’s more here than just a reminder to use your good manners. Why didn’t the nine return to give thanks? I would submit to you: Because it’s hard to bow down with a full belly. It’s hard to beg if you think you no longer have a great need. It’s hard to bow down unless you recognize the superiority of the one before who you bow. Having had their immediate needs fulfilled, the former lepers head to the priests, and then once declared “clean,” probably back to home. There is no more need to beg and bow down. They have received their lives back and they are ready to get on with living. Kiss their wives, play with their kids. To do all the good things they had been missing. Except for the most important! The nine get what they want, but they miss what they really need. The cares and riches and pleasures of life choke out their seedling faith, long before there is any fruit to bear. The temporal gifts they have received seem so much more important than the Giver. And they ending up missing the greater eternal gifts He has to offer. It happens far too often. It can easily happen to you and me. In a recent post, Pastor Hans Fiene wrote: “The greatest threat facing the church in America is not liberalism or Islamic terrorism or Hollywood or public schools. It’s the utter indifference and apathy of Christians who consistently prioritize money, sports, family, etc. over hearing the Word and belonging to their fellow Christians. The Gospel will remain on earth until Jesus returns, but it might not remain in your neighborhood, folks. Get back to God’s house. Wait too long and it might not be there.” Indifference leads to unbelief. Apathy leads to apostasy. Faith, on the other hand, keeps running back to Jesus. Faith keeps running back with thanks, and faith keeps running back for more. Faith’s belly never gets too full to bow down. By faith, the Samaritan who had been a leper knows that it’s not just that he was at the mercy of God; He remains at the mercy of God. And by faith, he knows there’s no better place to be. Chances are you are leaving here today and you’re going to fill your bellies—maybe too full to bend over, but hopefully never too full to bow down. Enjoy your time with family and friends and feast; they’re part of God’s good gifts, too. But never forget the greater gifts! Come before your Lord often to receive His mercy in Word and Sacrament. Live in your Baptism through daily contrition and repentance. Hold God’s Word sacred and gladly hear and learn it. Receive the very body and blood of your Savior Jesus Christ, given and shed for you for the forgiveness of your sins and the strengthening of your faith. And then depart in peace and joy. “Rise and go your way; your faith has saved you.” You are forgiven of all your sins. October 6, 2018 Rev. Robert Moeller, Jr.
Click here to listen to this sermon.“Let the children come to Me; do not hinder them, for to such belongs the kingdom of God. Truly, I say to you, whoever does not receive the kingdom of God like a child shall not enter it” (Mark 10:14-15). Dear friends in Christ, in the last few weeks, you have heard what a place of honor Jesus affords to little children. You have heard that one who receives a little one in Jesus’ name receives Jesus. You have also heard the warning against leading a little one astray, both through false teaching and failure to teach. And our Lord takes it one step further in our text this morning/evening. Jesus declares in that little ones can believe in Him, and are, in fact, models of faith. People are bringing their children to Jesus. They have heard of Jesus’ miracles, and may have witnessed some of them personally. They desire the spiritual blessing associated with Jesus laying His hands upon them, to receive His benediction. And these are not just little ones who can already tell you that Jesus loves them. St. Luke’s account of this story indicates specifically that the people were bringing infants—their newborn babies—to receive Jesus’ blessing. The kingdom of God belongs to little children, including infants. Put this knowledge together with other teachings of the New Testament, such as “whoever believes and is baptized shall be saved,” and “by grace you are saved through faith, and that not of yourselves—it is the gift of God; not by works, lest any man should boast,” and you get a powerful proclamation of God’s kingdom that goes against the conventional wisdom of man. But while Jesus does speak of the necessity of good works and bearing good fruit, nowhere does He ascribe one’s salvation to one’s own works. His blessing of the infants here in Mark 10 is undeniable proof of this. What works are infants performing toward their salvation? What good deeds are they doing in order to gain God’s favor? None, absolutely none! Why, these little ones could not even come into Jesus arms, if someone else did not bring them! And lest anyone here respond with the notion that little children are exempt from God’s Law and they are not responsible for sin until reaching an age of discretion or accountability, the Scriptures clearly declare otherwise. St. Paul writes to the Romans: “all have sinned and fall short of the glory of God” (3:23). King David laments in the 51st Psalm “surely I was sinful at birth, sinful from the time my mother conceived me.” And St. Paul also says without question that the wages of sin is death (Romans 6:23). So, while an infant may appear innocent and pure to us, the child still has the original sin that infects us all. And this original sin is a terminal illness, as is evidenced by the tragic fact that even babies can die. Knowing, therefore, that little children need the forgiveness of sins and the blessings of God’s grace, we understand the gravity of Jesus’ command not to hinder the children. But we also learn an important lesson about our own Christian lives as those who have grown up and confessed our faith. If a little child receives the forgiveness of sins and the washing of regeneration and renewal in the Holy Spirit—that is, receives saving faith and the promise of eternal life—it is fitting and right for us to recognize how God works to save all of His people. But dear friends, if God looked at your own works and deeds, as you do in this instance, and considered you righteous because of them, then Christ Jesus died in vain. Repent of all of the self-righteousness that continually creeps into your heart from your Old Adam. For although your Old Adam has been drowned in your Baptism, he’s still a good swimmer. The depravity of the human race manifests itself not just in the awful things people do to one another—in their sins against another, but, even more so, in the hardness of our hearts toward God Himself, in our unwillingness to receive everything from His grace. The sinful heart does not want to believe that the work of salvation is complete already, and that all are in need of it. This is the sin the disciples committed when they hindered the children from being brought to Jesus. And the children had to be brought into God’s kingdom. They could not bring themselves. Children receive the kingdom of God because God gives them faith in their Savior Jesus and He regenerates them in their Baptism. Adults receive God’s kingdom only when they despair of their own works and righteousness, and they possess a childlike faith. A little child does not add to the Word of the Lord and supplement God’s work with his own. A little child does not tell others that he is going to heaven because he’s a good kid. A little child receives God’s blessing and the promise of eternal life before he can even speak, because God attaches this powerful promise to His chosen means of Baptism. It is God’s work, not the child’s. Dear baptized, the promise of the forgiveness of sin and eternal life is yours as well, only because of God’s continued work in your earthly pilgrimage. For you have been justified by the faith which God Himself has given you, and which He feeds and sustains. He has declared you righteous in His sight, and draws you continually to His house. Here, He strengthens you and equips you to continually drown your Old Adam through repentance of sin, and trust in Christ Jesus to forgive you. Here, He comes to you with His mercy and grace. “At present, we do not yet see everything in subjection to Him. But we see Him who for a little while was made lower than the angels, namely Jesus, crowned with glory and honor because of the suffering of death, so that by the grace of God He might taste death for everyone. For it was fitting that He, for whom and by whom all things exist, in bringing many sons to glory, should make the founder of their salvation perfect through suffering. For He who sanctifies and those who are sanctified all have one source. That is why He is not ashamed to call them brothers, saying, ‘I will tell of Your name to My brothers; in the midst of the congregation I will sing Your praise.’ And again, ‘I will put My trust in Him.’ And again, ‘Behold, I and the children God has given Me’” (Hebrews 2:8-13). The Savior had to become like His people in every respect, and indeed He was even tempted as we are, yet without sin. The eternal Son of God became flesh to suffer and die in order to atone for the sins of the whole world. Thus, He, too, had to be an infant. The one, for whom and by whom all things exist, was made for a little while lower than the angels, so that by the grace of God He might taste death for every one. He was conceived by the Holy Spirit in the virgin’s womb and was born a child so that He might redeem all children from sin and the power of death. His whole life—from conception to death—was lived out in perfect obedience and holiness so that it might be credited to us by faith. Christ death and resurrection conquered the devil, hell, and all their power, opening the gates of heaven to all who would believe in Him. This includes little children, and, in fact, places them at the front of the line. Theirs is a simple, trusting faith that receives God’s grace and doesn’t try to replace it with something else. Theirs is a faith that is in the Incarnate Lord Jesus, who promised to be with His people unto the end of the age. Therefore, do not hinder the little children. Bring them to the Lord Jesus and encourage others to do the same. Teach your children about their Savior, and instruct them in the Christian faith, that they may examine themselves to be admitted to their Lord’s altar, when the same Jesus who touched the children to bless them now touches the lips and mouths of the faithful with His body and blood for the forgiveness of sins. Furthermore, approach the altar of your Lord this day in repentance and childlike faith, despairing of your own works of righteousness, and trusting in the love and mercy of Christ alone, trusting that you, His servant, may truly depart in peace, “For to such belongs the kingdom of God”—children and those of all ages who hear and believe these marvelous words: “You are forgiven of all of your sins in the name of the Father and of the Son and of the Holy Spirit.” Amen. October 6, 2018 October 6, 2018 Rev. Robert Moeller, Jr.
“Whoever causes one of these little ones who believe in me to sin, it would be better for him if a great millstone were hung around his neck and he were thrown into the sea” (Mark 9:42). There are certain things that you observe around you that let you know you’re in an election season. Campaign signs, mailers, televised debates, and endless commercials. And whether it’s a candidate or a proposition or school bond issue, one way they attempt to influence the voter is by making an appeal on behalf of the children. Candidates are pictured with children around them. Initiatives are promoted through children smiling and waving, perhaps even speaking words of their own scripted endorsement so that you, too, will support it. Either the person or the idea is presented as good because it is good for the children. And what kind of monster doesn’t want to do what is good for the children? While some of this material is a shameless emotional appeal to mothers and fathers who want the best for their own children, such campaigning is also based on a premise that cannot be denied. Children are our future. The children of today are the grownups of tomorrow. And it is the same for the Church on earth. To scandalize someone is to cause them to stumble—to shake the faith that they have in something or someone. We may have come to know the word scandal in our culture to be nothing more than juicy gossip that gives newspapers their cover story day after day—usually about a famous person’s private life. But in the biblical sense, the concept of a scandal is much more sinister. Jesus doesn’t leave any room for His people to be flippant about their behavior toward others, the little ones in particular. Our text this morning follows the events of the reading from last Sunday, in which Jesus took up a child in His arms and declared that whoever receives such a little one in His name receives Him. This child is still in their midst today when Jesus warns against causing such a little one to sin. Throughout the New Testament, little children are held up as the example of faith to the church. Jesus said explicitly that the Kingdom of God belongs to them. Why is this? We know from Scripture that children are not sinless. All have sinned and fall short of the glory of God. The wages of sin is death, and we know that children, too, are subject to death. We know that they are conceived and born in sin, and that, like adults, they would be eternally lost without God’s saving grace. So what makes little children the examples of faith? Why is childlike faith revered above all? We begin to understand the danger of scandalizing a little one when we come to realize the nature of a child’s faith. The faith of a little child is a faith that has been given through her baptism and is fed through hearing about her Savior Jesus. It is a faith that has not yet been subjected to the temptations of the world. A child is sinful by nature, but she doesn’t yet receive reinforcement of sinful behavior from others. She also has not yet been subjected to schoolteachers and college professors who will ridicule her because of her faith in Jesus. A little child receives God’s Word, Christ Jesus, and trusts in Him without being attacked on all sides. A little child isn’t afraid of talking about her Savior because of what others will think! Hers is a complete faith and trust in her Redeemer Jesus. She may not be able to articulate it. A little child may not yet be able to understand the full meaning of all the words of the Lord’s Prayer or the Creed, but the faith of her heart is not contingent on the ability of her mind to process it. This is another important aspect to remember, that faith is of the heart and not of the mind. Faith is not a mental exercise or a deliberate action of the will. Faith is not a decision that is entered upon and then never subject to second thoughts. Faith is God’s instrument for receiving His salvation by grace. It is God’s work, and it is His gift to us. And the faith of a little child is one that has been received and has not yet been polluted by the world. 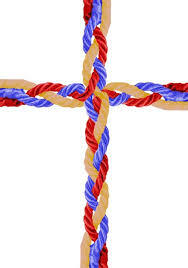 It is focused on Jesus and is not divided between Him and other things. The little child believes and has not yet been taught to doubt. Thus, the faith of a little child is the strongest and purest of all. Woe, therefore, to anyone who would damage the faith of these little ones! Jesus isn’t being dramatic when He speaks of a millstone being hung around one’s neck, mob-style, and being thrown into the sea. It truly would be better for such a scandalous person to have that happen, because at least in the bottom of the sea one would not be able to scandalize any more children. At this point, your thoughts might be focusing on a couple of more obvious scandals to children that receive such prominence in our day—child abusers and child predators. But as heinous as such crimes against children these may be, we need not go so far as physical abuse to truly scandalize a little one and cause them to sin. We need only consider what is needed to sustain a child’s faith and realize our own failings in our responsibility as Christians to nurture that faith. At the end of our text, Jesus speaks of the saltiness of salt, and tells you to have salt in yourselves and be a peace with one another. Now, our Lord is not speaking of the level of sodium in one’s diet. Rather, He speaks about salt as it has always been used by man —as a preservative and seasoning. All our conduct as Christians is to be seasoned with salt. Our lives are not to be lived according to our sinful nature, but seasoned with God’s gifts of grace, which strengthen us against the temptation to sin and also enable us to give a faithful Christian witness to everyone. Your conduct, therefore, in every situation, must speak well of your Lord, and this includes your conduct toward His little ones. Children don’t need any help being sinners, but woe to him who provides such help. This includes not just teaching one’s children sinful behavior by means of bad example, but also failing to bring up one’s children in the fear and admonition of the Lord. Jesus does warn against outward sin against little children, but He speaks here more broadly against anything that damages a child’s faith. And there are plenty of ways that remain rampant among Christians. Parents who bring their child to the waters of Holy Baptism promise to teach their children the ways of the Lord, and when they fail to do so, they not only break their promise, but they also cause their little one who believes in Jesus to stumble, because they starve their faith. A parent who doesn’t properly nourish their child with food, clothing, and shelter is charged by the state with neglect and child endangerment. A parent who doesn’t nourish a child’s faith neglects and endangers the child’s soul. It would be better if a millstone dragged such a teacher to the bottom of the sea, where they could not harm others. The Christian congregation in general also has the responsibility to its young people to provide an example to them. Christians are to show love for the children of their parish and rejoice that they are there on the Lord’s Day to hear of Jesus and know that He died to forgive them of all their sins. Christian adults should be ready and willing to tell the little ones about Jesus in Sunday School. Pastors have the honor and privilege of assisting parents in the instruction of their children by meeting with the children during the week, to help them to examine themselves for worthy and prepared reception of their Lord’s body and blood in the Sacrament. All Christians have the duty before God to nurture and encourage the Christians of tomorrow. We all have the responsibility to let our light shine before men and provide an example to those who are most impressionable. This applies not just to little ones, but even to adults who are still “little ones” in the faith. No one should conduct oneself in such a way that others are surprised to learn that one is a Christian. Your Christian faith should be known to others by the fruits you bear. Just as a good tree bears good fruit, so also does a true faith show itself through good works and example. Your children are watching you, and so is the world. The world is waiting for you to slip up and provide them with the dirt of scandal. The world rejoices when the Christian causes the little ones to sin, for it confirms itself in its own rejection of Christ Jesus and basks in your failures. Don’t give the world what it desires in finding excuse to reject the Gospel! As James said in our Epistle reading, resist the devil, and he will flee from you. Be humble, and speak evil of no one. Be imitators of Christ, who returned no evil for evil, who endured the cursings and revilings of the world, but who did not apologize for the truth and went to the cross for it. Christ Jesus went to the cross for you. He went to the cross and died to atone for all of your weaknesses and all of your failings. He took all of your poor behavioral examples, all of your indifference, all of your lacking, and nailed it to that cross. He hung a great millstone around all the things you do as a sinner to cause His little ones to sin, and has cast them into the deep. Your Lord Jesus has blessed you, His people of this particular time and place, with the gift of His Word that makes you wise unto salvation. And He has entrusted it to you for the instruction of the little ones. He gives to you His Word and faith to keep and preserve you, to equip you in your responsibility to future generations. And He invites you to receive from Him the strength to remain in that faith that trusts in the crucified and risen Lord. This same faith He provides to the little ones that they would believe in Him unto life everlasting. His promises are as much to them as to you who have confessed your God-given faith. Therefore go, and in service to Him, render God-pleasing service to His little ones. Encourage them in the faith, teach them in the way they should go, so that when they are old, they do not depart from it. Our Lord bless and keep you strong and steadfast in His Word, and sustain you according to His faithful promise, that you would be an example to the little ones who will carry the faith to the end. Go in the peace of the Lord and serve Him and with joy. You are forgiven all your sins.